Waltham, MA, February 18, 2015—Karen Pryor Clicker Training (KPCT) is proud to announce that Karen Pryor has been awarded the prestigious of Trainer of the Year honor for her achievements in canine and animal training at the recent Purina Pro Plan 60th Annual Show Dogs of the Year Awards. 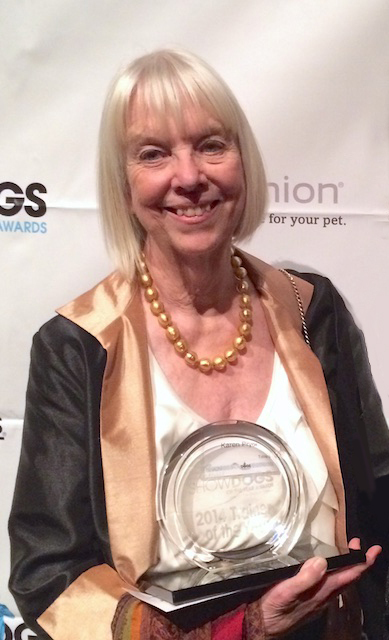 The awards were presented at a black-tie banquet held immediately prior to the Westminster Kennel Club show on Saturday, February 14, 2015 at Gotham Hall in New York City. Presented by Dogs in Review, the Purina Pro Plan Show Dogs of the Year Awards represent the best of both dogs and industry professionals who have shown consistent success in the world of conformation. The Award statuettes, also known as the Winkies, were presented to the year’s highest achievers in show dog categories and as Special Industry Awards and Annual Achievement Awards. Along with Trainer of the Year, the Special Industry Awards include Shelter of the Year and Groomer of the Year. Longtime friend Terry Golson accompanied Karen to the awards ceremony. She presents her insider’s view here. Karen Pryor Clicker Training (KPCT) is a leader in the field of animal training and a recognized world leader in the science and application of marker-based positive reinforcement, or what is often call “clicker training.” KPCT operates Karen Pryor Academy for Animal Training & Behavior, the ClickerExpo educational conferences, and its popular website, clickertraining.com. Karen Pryor Academy Certified Training Partners hold classes and work with pet owners and their dogs at more than 135 locations across the globe.